Are we Denying Our Youth? Timeless Attraction. The mission of the Boy Scouts of America is to prepare young people to make ethical and moral choices over their lifetimes by instilling in them the values of the Scout Oath and Scout Law. The purpose of the Boy Scouts of America, incorporated on February 8, 1910, and chartered by Congress in 1916, is to provide an educational program for youth to build character, to train in the responsibilities of participating citizenship, and to develop personal fitness. The Mission and Purpose of the Boy Scouts of America are and shall forever remain unchanged. 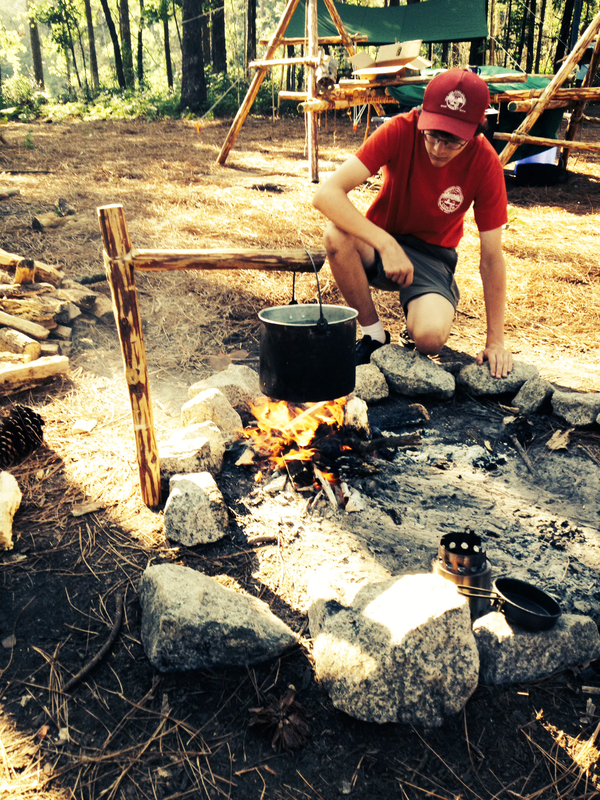 A Dovetail Notch is used to fashion a “One-Legged Fire Crane” to boil water in a fire pit at Scout camp. At the same time, the contribution that our heritage of outdoor skills makes to the richness of the Scouting experience is also unchangeable. Over the years, as evidenced in the contents of various Scouting publications, some “old School” Scouters might have observed there’s been something of a gradual shift away from the emphasis on many traditional campcraft skills that for a hundred years have attracted young people to our movement. 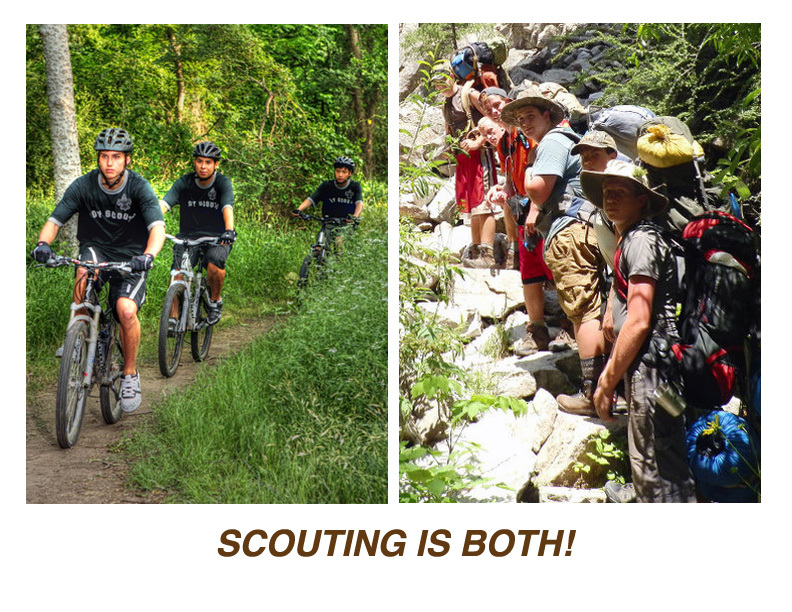 Naturally, the BSA is rightfully compelled to keep up with the times, assuring that the Scouting program is relevant to today’s youth. However, even though modern Scouts are understandably attracted to the new developments and technological advances obtaining in today’s world, when they are exposed to the many timeless skills that were practiced by resourceful frontiersmen and passed down through the ages, they are eagerly receptive and captivated by the undeniable mystique. Many experienced Scouters find it regrettable that as a matter of course today’s Scouts are not granted the same opportunities to experience what is too often mistakenly construed as “old-fashioned.” The outdoor skills that in the past inspired many ideas, activities, and Scouting fun, are still most relevant and most useful, even in the midst of this fast-paced digital age. 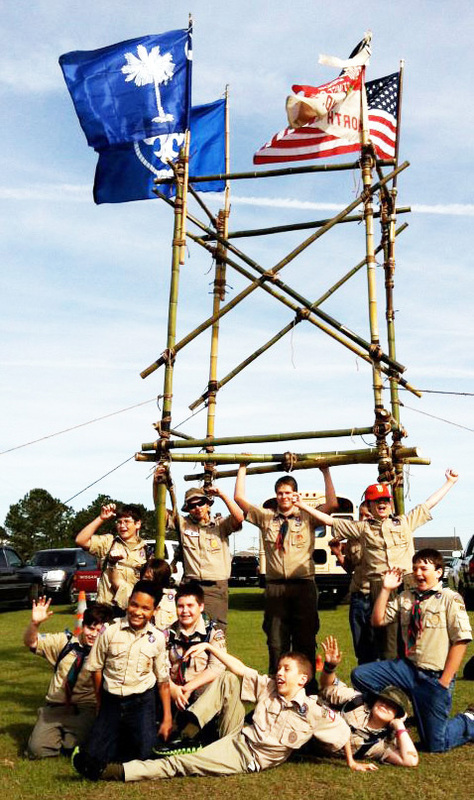 Scouts strike a jubilant pose after hoisting their Four Flag Gateway Tower at a Scout Expo. Are we Denying Our Youth? Because there are so many additional, modern program ideas prevalent in Scouting today, it’s easier than ever to deny our youth much of the magic and wonder that in the past attracted many of us as Scouts. When demonstrating the art of fire making, elaborate camp cooking, pioneering, and pre-technology campcraft, the Scouts in attendance are openly enthusiastic. The fact is, many of today’s Scouts love this stuff—just like many did over half a century ago! I’m not grabbing at straws here, due to nostalgia for the good ol’ days. Neither am I motivated by an attempt to alleviate the disappointment experienced when seeing that many of today’s Eagle Scouts can’t light a fire in the rain or put up a traditional dining fly with guylines and tent stakes. But, I am motivated by what I maintain to be a path the BSA should take in conjunction with new, high-tech developments and STEM, to increase membership and retention—a launching of a renewed emphasis on the timeless, traditional outdoor skills. Youth Relevant. We all believe Scouting has to keep up with the times. The BSA must keep its program “youth-relevant.” But, at the risk of being redundant, amidst the wide spectrum of fun available in Scouting, there’s always an attraction to and fascination with what’s termed, “old school.” It’s apparent, along with the new push for the STEM/Nova program, and all the “high adventure for the mind” merit badges like space exploration, digital technology, and robotics, a large population of today’s Scouts are still greatly enamored with acquiring the skill sets revolving around wilderness survival, the building of an impressive pioneering structure, and the creation of an amazing, front country campsite. Round Lashings join tougher two Scout staves for the upright poles of a patrol dining fly. Imagine further, knowing how to improvise their own stakes (without impacting the environment) and using their resourcefulness to attach the guylines when the tarp had a ripped out grommet or no grommets at all. BP’s Ideal Camp. Baden-Powell said, “My ideal camp is where everyone is cheery and busy, where the patrols are kept intact under all circumstances, and where every patrol leader and Scout takes a genuine pride in his camp and his gadgets.” Personally, especially for a long-term camp, I’m a huge proponent of bringing all the materials needed to build an array of useful, impressive (and fun) camp gadgets. 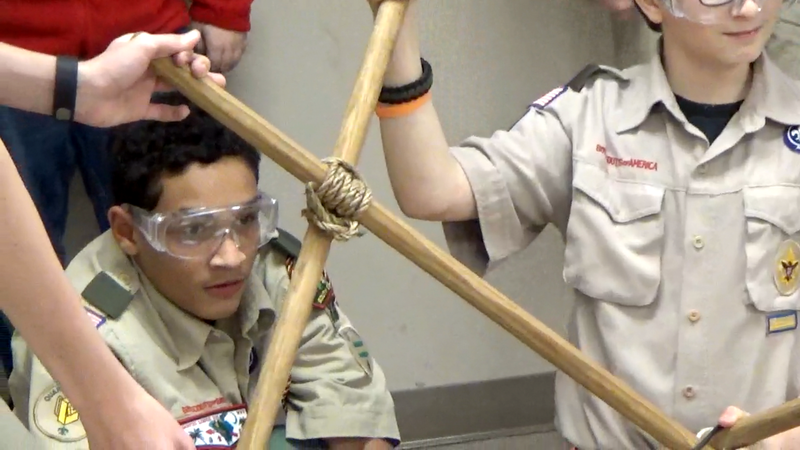 Scouts can put together everything using their walking sticks with zero environmental impact. Relevancy and Usefulness. 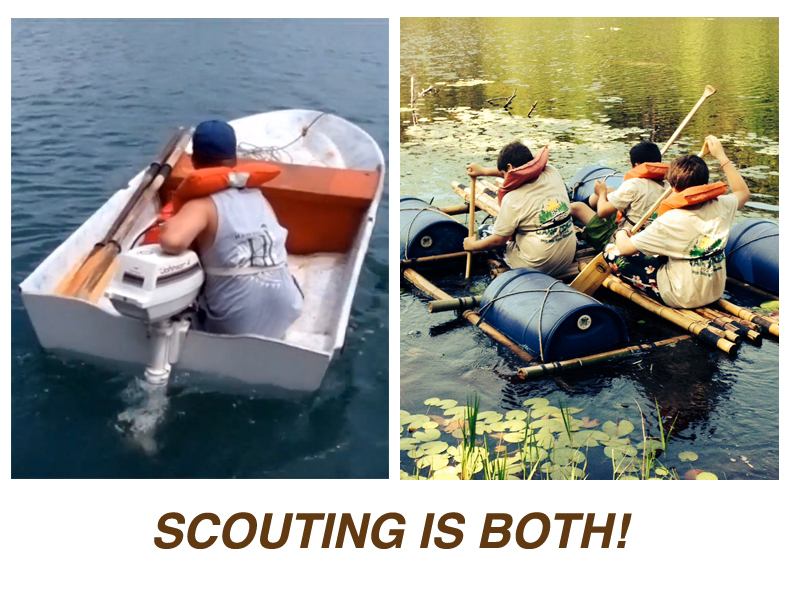 An experienced Scouter recently commented on a LinkedIn poll, that Scoutcraft skills are relevant today, “IF they’re taught in conjunction with the WHY and not just the HOW.” He stated that Scouts need to be able to make a connection that is relevant to them. 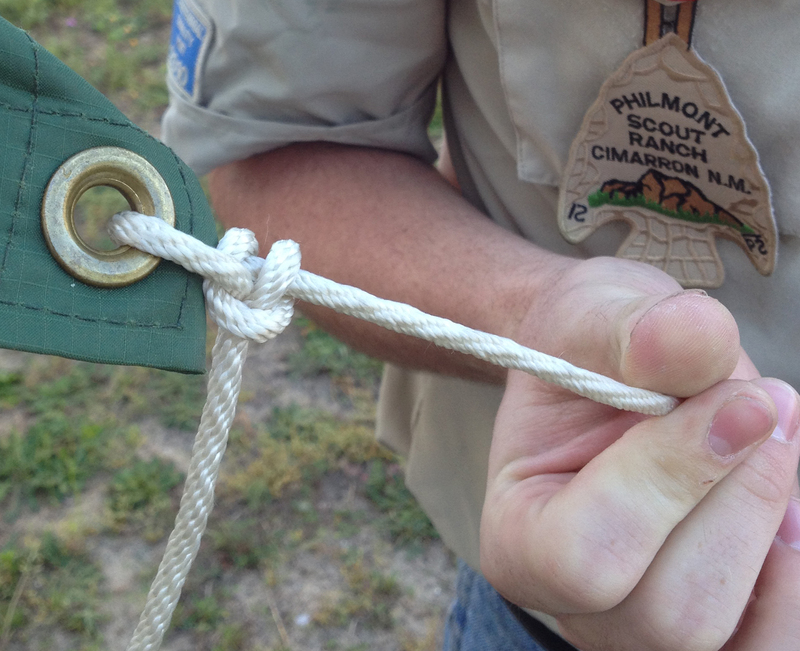 As an example, he sited teaching two half hitches is “the proper knot for connecting a guyline to a dining fly” but “is irrelevant if your troop doesn’t use dining flies or if you have the ones with the nifty little plastic widgets where a proper taut-line hitch is supposed to go.” He concluded his comment by stating, “make it relevant and they will learn AND retain.” Learning to tie two half hitches (clove hitch around the line’s standing part) to attach a guyline to the grommet of a tarp is, as mentioned, part of an array of skills that can come into play when erecting a dining fly in one of the “old-fashioned” ways. These skills can be very useful when: new-fangled stuff malfunctions, there’s a shortage of manufactured paraphernalia like on a backpacking trek, or you just want to have fun being impressive using “primitive” camping techniques. Using “nifty, little, plastic widgets” is fine, as is erecting a shelter with a metal framework when “car-camping.” But, it’s also practical to know how to put up a tarp “Philmont-style.” The knowledge and abilities that lie therein can be VERY relevant and very useful! Scouting is both the time-tested old and the attractive new! Presenting Scout Skills. Outdoor Scout skills, are presented best and most effectively, when done so in conjunction with activities. That’s activity-based instruction! After the Scouts are enabled to actually demonstrate the skill, they should do something with it that: engages them, that illustrates its use, and that’s FUN! Just look at the expressions on the faces of Scouts while they are involved in putting their skills into action in a way that’s challenging and fun, and you’ll be able to gauge not only their high level of involvement, but also their pleasure. John Thurman, Camp Chief at Gilwell for over 25 years, alluded to this in one of his many books, Pioneering Projects. I quote, “It is all very well to learn to make knots, bends, and hitches, and to lash things together. Up to a point this is an interesting activity, but inevitably it begins to pall unless the Scout is given a chance to do something effective, interesting and to some degree adventurous with his knowledge.” Personally, I even employ some unevenly-matched tug-of-war action when introducing a rope tackle. This activity really demonstrates in a memorable way how this rope configuration provides a useful mechanical advantage when one needs to apply proper strain on a line…and it’s lots of fun! An “Old School” Advantage. 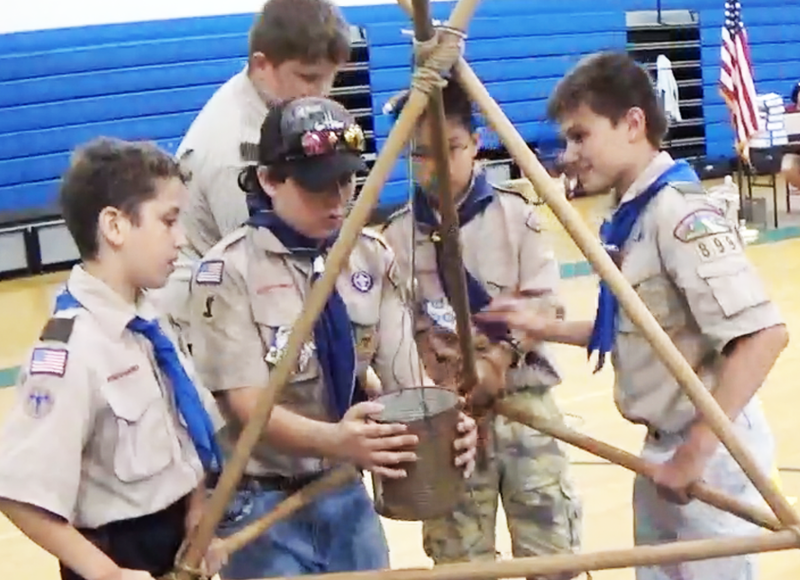 “Old School Scouting” skills can live happily side by side with high-tech advances. But, when new materials are not available, or malfunction, a Scout should be equipped with the skills to make use of whatever is at his disposal. Hand in hand with learning and applying Scout skills is resourcefulness, ingenuity, and using our available resources to make things happen. It’s Useful Stuff. In 1994, pioneering legend, Adolph Peschke introduced me to the butterfly knot and tying a rope tackle. Suffice it to say, I’ve used this outdoor skill on numerous occasions. It’s very effective, very handy, and very useful, especially in the great outdoors and pioneering. Then there’s the diamond hitch. The prospectors of yesteryear used it to pack their burros. It was one of the many interesting outdoor skills featured so invitingly in the older, older Fieldbook. Of course there aren’t so many burros out there anymore, but we do still see some roof racks and flatbed trailers. Best solution I can think of when you have no bungee cables but have some cordage. Actually, you can keep the bungee cables. The diamond hitch works better! The Old and the New. It’s all about striking a balance between the timeless and the modern. When I started as a Boy Scout, most all the personal flashlights were double D-sized. Now we have super bright, tiny LED lights. If I had my old light from the late 50’s, though it would still shine a beam, it would be a whole lot less bright and a whole lot more cumbersome than my cute, little LED light. I’m an old guy enjoying my modern technology. On the other hand, take the pre-modern technology, outdoor wood tools skills necessary to prepare the tinder, kindling, and fuel for a fire, when all you have is a log, a hand axe, and a knife. Now, light the fire and keep it burning when all you have are two matches, or maybe, no matches at all. Here you can see that whether it be yesterday and today, these kinds of skills remain constant. And of course, Scouts from both yesterday and today love this kind of stuff! The old and the new. 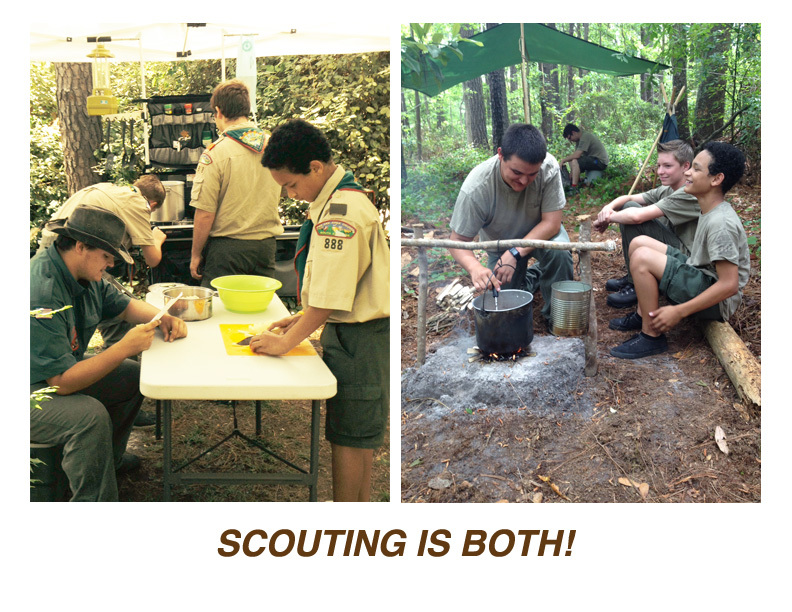 Scouting is both! Scouting is both. At the Jamboree, I had the opportunity to sit down with Jack Furst who helps oversee the BSA’s high adventure bases. Being involved with Pioneering, we were discussing various approaches to include a pioneering training program at the Summit. Jack’s “wheels” are always turning, and he put forth an idea that would simultaneously present Scouting in both a marvelous high-tech, and, a fascinating old-school light. For example, on one hand you have a camp kitchen that features the new “GrubHub,” organizer—a chuck box-sized, all-in-one kitchen fixture that has everything including the kitchen sink. On the other hand you have a back-to-basics camp kitchen, cooking area, featuring two forked sticks with a crossbar suspending an 8 quart pot over a zero-impact cooking fire, and a collection of useful camp gadgets made primarily of Scout staves: double A-frame table, tool rack, fire bucket holder, and wash station. Scouting is BOTH! Pioneering. Quoting John Thurman, Gilwell Camp Chief for over twenty-five years, “There are few activities which, properly presented, have a greater appeal to the Scout and Senior Scout than Pioneering and ever since the introduction of Wood Badge training, Pioneering has been given a full share in the program of Scouters’ training.” Very recently I visited a troop located out in the SC boonies. The Scouts in this troop are a gung-ho, gang—eager and receptive. That’s why you gotta love ’em. The purpose of this first of three consecutive visits, was to give them the tools they’d need to put up a Double A-Frame Monkey Bridge at their council’s Scout Expo. 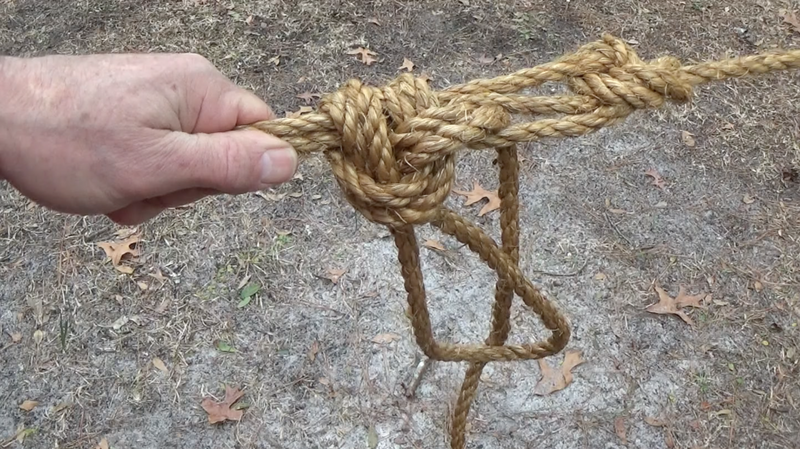 The sixteen Scouts in attendance responded very favorably to each aspect of a well-presented EDGE approach to tying the Mark II Square Lashing. There was learning and there was laughter! The subject matter was old school, traditional Scout skill stuff, and they gobbled it up! After they were enabled, and as a culminating activity, their SPL divided them into four crews to make Scout Stave Launchers. That’s when the real fun began! In conclusion. The sentiment shared by many is that it would be most beneficial if Scouting was presented as a value-based program that offers extraordinary opportunities to build character, while learning a broad range of new and timeless outdoor skills that are fun to use, yielding the ability to take care of oneself and others. It’s been repeatedly spelled out: Scout outings provide the magical laboratory for putting these skills into play. As B.-P. wrote, “Scouting is a School of the Woods.” Of course, Scouting also provides numerous other avenues of interest and relevancy. But, in accordance with Scouting’s founders, these areas of learning and discovery will always surround Scouting’s everlasting hallmark—getting out and thriving in the majesty, beauty, serenity, and immediacy given to us by God and forever found in the great outdoors.